Admittedly it was @PDarral who pointed this out to me. I was never comfortable with the idea myself either. It’s sprint burndown charts that use “Hours of remaining effort” on the vertical axis. 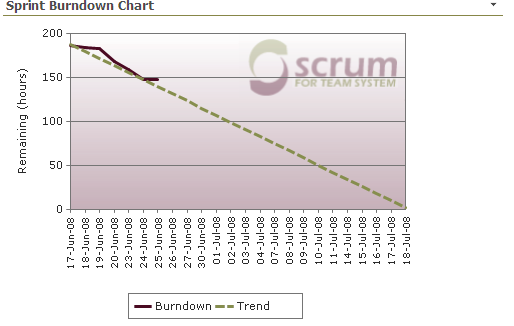 A sprint burndown chart (or “sprint burndown graph”) depicts the total task hours remaining per day. This shows you where your team stands regarding completing the tasks that comprise the product backlog items that achieve the goals of the sprint. The X-axis represents days in the sprint, while the Y-axis is effort remaining (usually in ideal engineering hours). Having taught physics for a while and being an engineer I can’t help myself to think a graph like this ultimately represents time vs time. So long as we don’t approach the speed of light time goes at a pretty constant rate therefore the only correct line in the graph would be a straight line. I know, it’s not clock hours, it’s remaining effort (ideal hours) and we are tracking our true progress against estimated time therefore not having a straight line should be OK. Still, to maintain the burndown chart we have to track progress and with a graph like that is needs to be progress in hours. Yet as people who grow and learn a particular perception of time we use clocks to track those hours. So when we record time we usually won’t think “Well, today in my 8 hour day I did only 4.5 ideal hours of my estimate”. It is just too easy to game the system as well “If I don’t tweak the numbers it will look as if I only did 2 hours yesterday”. For good, confident Scrum teams this will not be an issue. For forming and storming teams the temptation might be too big. It also provides a temptation for management (even though sprint burndown chart is solely a tool for the team) to say “You guys have only 5 extra hours left it seems, with a bit of over time you’ll be done on time”. My answer to the problem is simple – although it requires some more discipline in analysis – break your stories down and track story points also in the sprint burndown chart. With these thoughts I was glad to listen to Kevlin’s Henney talk at NDC 2010 who made some further remarks along the same lines. I’m glad Jeff Sutherland also recommends burning story points. Funnily enough, one of my teams is moving to only reporting points burndown. Our motivation comes from a desire to do task creation when we’re ready to start the story rather than upfront in a planning session, meaning ideal hours isn’t even known at the start of the sprint. Agree with story points being better for the Y-axis. If you break down your stories and say every stories is less than two days you can even have story count on the Y-axis. Which works and also forces you to break down the stories so you can see how you are progressing towards your sprint goal.